I replied to MTaylor3d on Facebook, but for anyone else interested; Check out the coaster example map, it uses a pawn based train carriage. 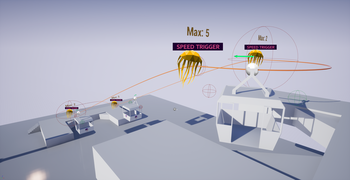 This allows the player to move with the train and control the camera to look around. This is obviously a simple example to demonstrate what can be done, but it's a good starting place for anyone wanting to 'lock' the player in as they move around. 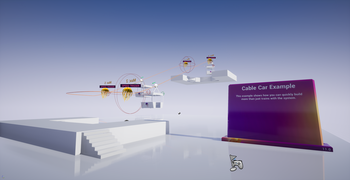 Hi, I wanted to make a VR rail shooter, and was trying to figure out the "proper" way to go about attaching the character to the cart(I'm a 3d artist, still trying to learn blueprints). I tried simply attaching the FirstPersonCharacter(or VRPawn) to the cart, but that doesn't seem to work. I had read on the UE4 Marketplace that, "you'd need to convert the base class of the carriage to be a pawn". If that is the best way to go about it, could you elaborate? Love this rail system by the way! Looks like you have some custom tracks going on there. Would it be possible to send me some screen shots of the expanded track settings? Or if it's possible, could you send me the files? The support address support[at]polygonjelly[dot]com is easier than using the forums if you're sending files / want to keep your screen shots private. On the custom tracks; from the screen shots it looks like the mesh is stretched out a bit, is that intentional? I actually managed to find the solution to my problem. The default Max Connection Distance was slightly too low. I bumped it up a bit and everything is working perfectly now. Thank you for help though. You've made a great application, look forward to using it to hopefully make something pretty cool. Sorry you're having an issue. Could you provide me with a bit more info on what's not working about it? The tracks handle the connections themselves, so when you drag the end of one track into the start or end of another it will make the connection and you should see the connection arrow vanish to indicate a connection has been made. When you drag the track away, the arrow should reappear to indicate that there is no connection. The connection tool isn't 100% necessary in a level, it's there more as a helper if you're doing a lot of track work. It will just refresh all track connections. 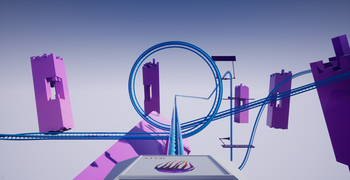 Each track will refresh if it's moved, or the level is reloaded or if a track gets within connection distance. I've made an image that might help you out, it's at the bottom of this post. If that doesn't solve things for you let me know, and please provide as much info on the issue as you can. For whatever reason, I just cannot seem to make a connection between the tracks, even when it appears they are linked the orange and green arrows will not disappear. 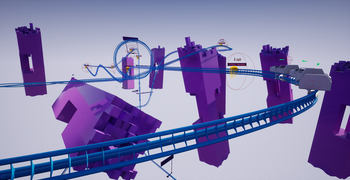 I made a duplicate of the first piece of track, as shown in the YouTube tutorial, so the pieces are definitely synced/level. 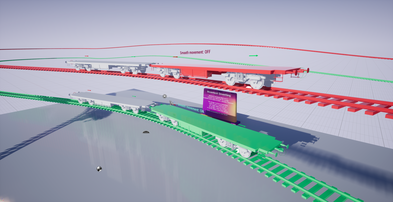 I've inserted some screen caps of how the tracks are situated at the moment. 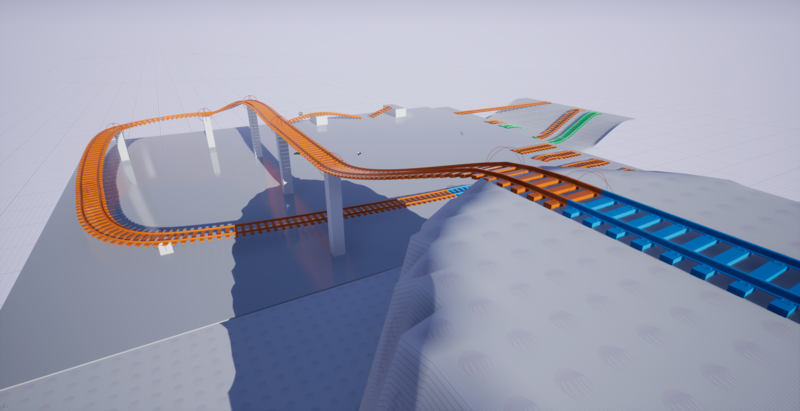 I've been having a bit of an issue with the connection tool, when trying to connect two pieces of track. I have followed the YouTube tutorial and copied it step by step to no avail. Is there any chance the update might have slightly changed the tools functionality or application? Is it possible to "power up" inclines without adjusting the max speed? NEVERMIND! I can probably solve it by setting a speed trigger before the incline. Thanks! Last edited by clone45; 02-18-2018, 03:28 PM. Sorry for the delay in responding I didn't get any email notifications or messages about the posts even with a topic subscription. Thanks to Bret for mailing me about the new posts. Thanks for letting me know, I'm not able to test this out right now, but I will first thing tomorrow and see what I can do. I'll update this thread as soon as I have a reply. Yep, your blueprint for starting and stopping the train look good. For the speed question; this isn't something that's currently available, but you can add it with a small bit of work. So the best option would be to change the calculate speed function. You can add a new variable which is the target speed, then you can set that to be 0, 60, ... then use a float lerp to move the current speed to that target speed value, setting the current speed as the output. Nice and easy and not too big a change. 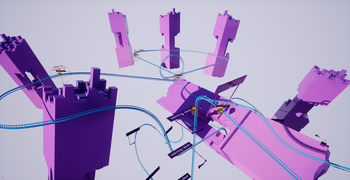 If you have any trouble with it, or need any help with the blueprints feel free to post here or fire a mail to the support address. The character uses the normal Unreal gravity rules, so during a loop they would fall down if not secured to something. If it's a train carriage then you'd have a roof on there, so collision would keep the character inside, but if it's a roller coaster then you'll need to anchor the character in place. If a character (TPS) is inside of the train while it is going through the loop will he stay upright with feet on the floor the whole time? I'm interested in essentially having a playing level on the inside while the train runs through all kinds of obstacles, but I can't have the characters flying around inside on every loop or sharp drop. I'm trying to control a train using input. I know this question was asked in a previous post, but the solution of setting the Max Speed seems to bypass the acceleration process. 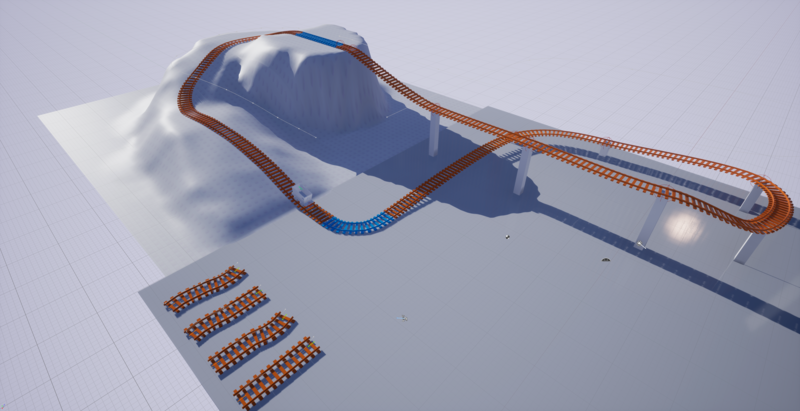 In other words, if I set the max speed in blueprint from 0 to 60, the train will instantly be going at the new speed. I don't want to have to compute the acceleration, deceleration, mass, friction, and gravity in order to ramp up to the max speed myself. Is there a setting or option where, when the max speed changes, the train will either accelerate or decelerate until the new speed has been reached? I have another question as well. I've figured out how to apply the breaks using the Apply or Release Breaks component. However, when I release the breaks, nothing happens. How can I release the breaks and have the train start moving again? Last edited by clone45; 02-11-2018, 02:52 PM. Your system made my headaches disappear, thank you! I've dived into the blueprints, checking out how things are working and found one small problem. Tho it isn't really a problem, but a missing feature. I'm trying to add this 'feature' but with little success. If a carriage has a parent and you want it to follow in turns, the distance between the carriages are always getting lower depending on the trun size. Since the child carriage is constantly following the parent with a fix distance, it could be only solwed by changing it to a dynamic distance. 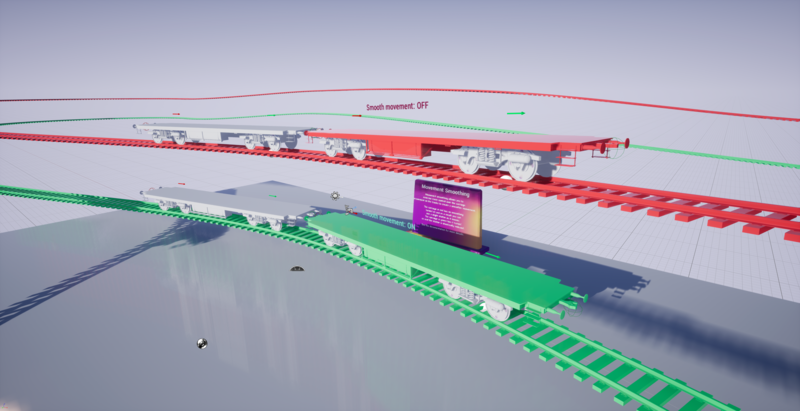 The 'Distance from parent' value could solve this issue, but even if it's being updated every frame, the distance isn't changing between the carriages. The update is now live on the marketplace. The documentation has also been updated, if anyone has any issues or questions, please ask. Last edited by PolygonJelly; 01-09-2018, 05:24 PM. 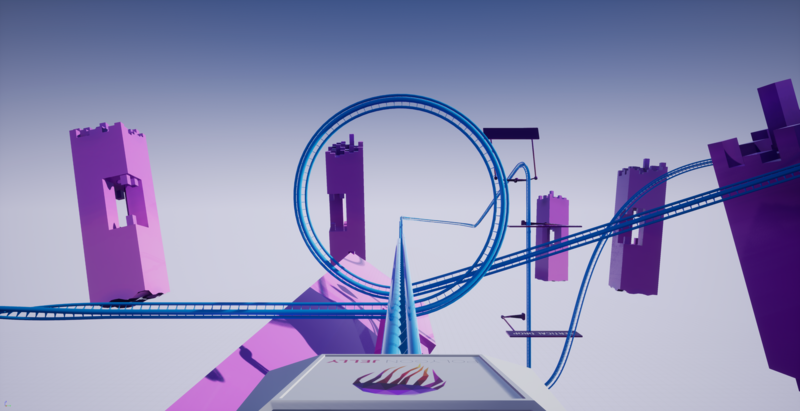 Large update coming this week with a new roller coaster example map (with vertical drop), new speed triggers, updated terrain track, track baking updates and a cable car update. We'll update this thread once the update goes live. We will be pushing out an update in the next few days with two big features. We have updated the movement of the trains along the track to allow for extra smoothing to be performed, this will result in a much more clean movement. The terrain track has been fully updated and now comes with more options. We have added a control spline that hovers above the track, allowing you to edit the terrain track with more control and less moving around inside the editor. Options have been added to copy all tangents, or just the first and last, giving you total control over the connection into other tracks on level ground. We'll post more info here when the update goes out along with updated documentation.